WordPress or Joomla: Which CMS is better to Deploy in your site? Choosing the best CMS that incorporates your online business success is more important, which has capability to meet your significant requirements and stand away from crowd to maintain the brand identity. With better functionality, CMS framework allows users to edit, publish as well as organize the website content effectively. Today, there are lots of CMS available and among them WordPress and Joomla are famous. Both frameworks are powerful and open source. Now, the question is, which Content managing technique is better to implement in the site. 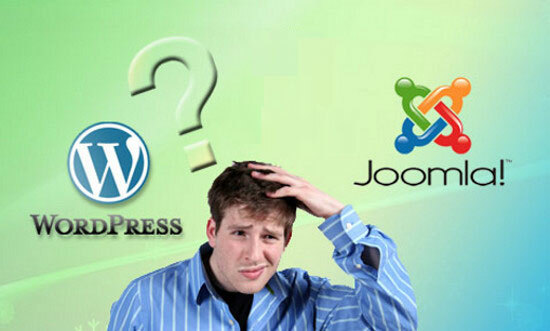 Here, this blog offers general ideas defining WordPress and Joomla. WordPress is an open source blogging tool and content management system. The framework is written in PHP language compatible with MySql database software. It comes with various plugins and themes that can be utilized in generating a complete web site. Joomla is a content management framework. It is completely written in PHP and object oriented programming techniques is used. This technology can be used in developing the online forum, E-commerce portal, corporate site and lots more. Now comes to the difference between these two technologies in terms of features. Effortless installation: as this technology is easy to install and configure. You just need to download the WordPress then follow the instruction given at the time installing, after you click you witness that the system get installed. Easy to customize: Now there are more than thousands of themes available on the internet, some of which are free and some may cost you. There is only need to download the theme and after that just make changes in configuration, the site will be prepared. User-friendly: This technology is very user-friendly. It can be used by non technical and technical professional. Difficulty coding unique theme: Although it is known that there are thousands of templates presents but if you want to give the fresh look to the theme then it can be difficult, even for the experienced web developer too. Vulnerable architecture: The most important aspect is security, anybody can breach the security because the framework is open source and anyone can know the coding style. So it is easy to break the WordPress. Maintenance cost a lot: having an exclusive website needs unique template, content and lots more that can be only be paid. So owning the fresh site cost you besides this the hosting cost and variable cost is also included. Superb Extensions: Large numbers of extensions are available to offer various functionalities to the site. Multi-user handling: Suppose multiple users are handling the content then the Joomla provide a permission table that supports nine different kind of permissions for controlling the web content. Easily deployable: Joomla is easy to be implemented. This framework takes minimum time to be installed on the system. Tricks for SEO: As per CMS basis, there is needed little hard work for optimizing site as compared to WordPress. Need skill to customize: It is can only be utilized by the developer, for non technical person it is compulsory to have the skill to make the site work. It is concluded that both the techniques are reliable and both are implemented on the basis of requirement. Like if you are beginner to web page developing and want simply to develop a blogging site then WordPress will be best otherwise the Joomla will be good for advance sites. Hope that you have the idea about where to implement both these web development technologies. If find any confusion then please share it through the comment section given below. Posted By: CSSChopper Team- WordPress Development & Joomla Development Service Provider.